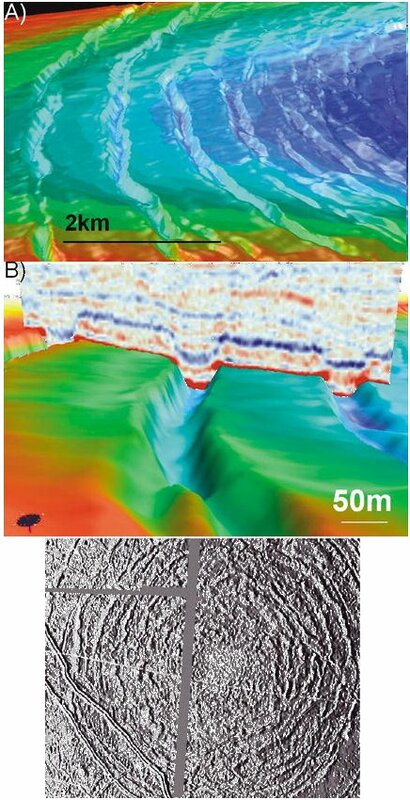 The seismic maps peel off overlying rocks to reveal the chalk features (Image: GSAB/Stewart/Allen) cm. 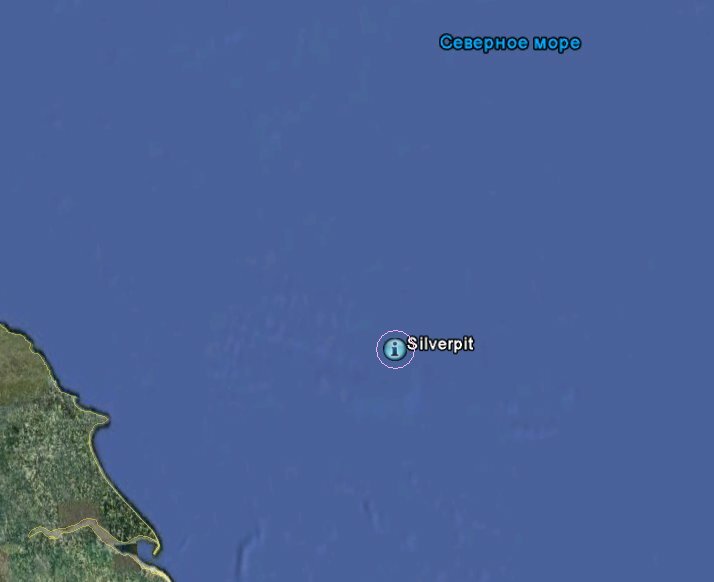 Silverpit crater mapped at top Cretaceous chalk. Greyscale shading is geological dip - darker is steeper, darkest linear trends are fault scarps. Numbered locations are hydrocarbon exploration wells. Green line is location of seismic line shown in other Figure. cm. Seismic examples from Silverpit structure showing structural form and geometry of the older and younger strata. 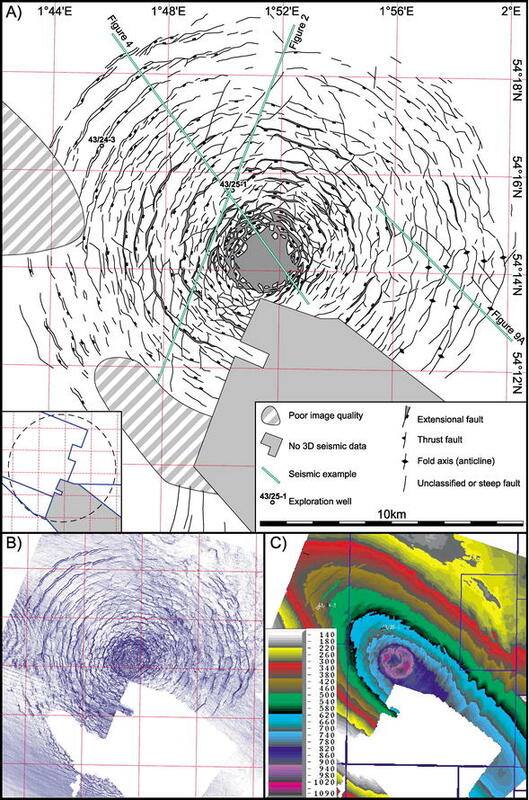 A. Uninterpreted seismic line, location shown on other Figure. 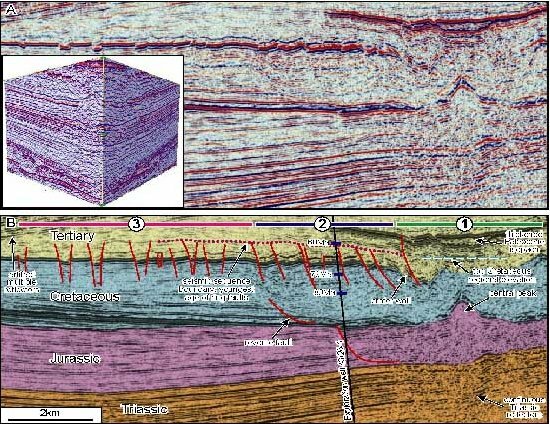 Inset cube shows the relatively unstructured underlying Triassic and top Permian seismic reflectors. B. Annotated version of seismic line. 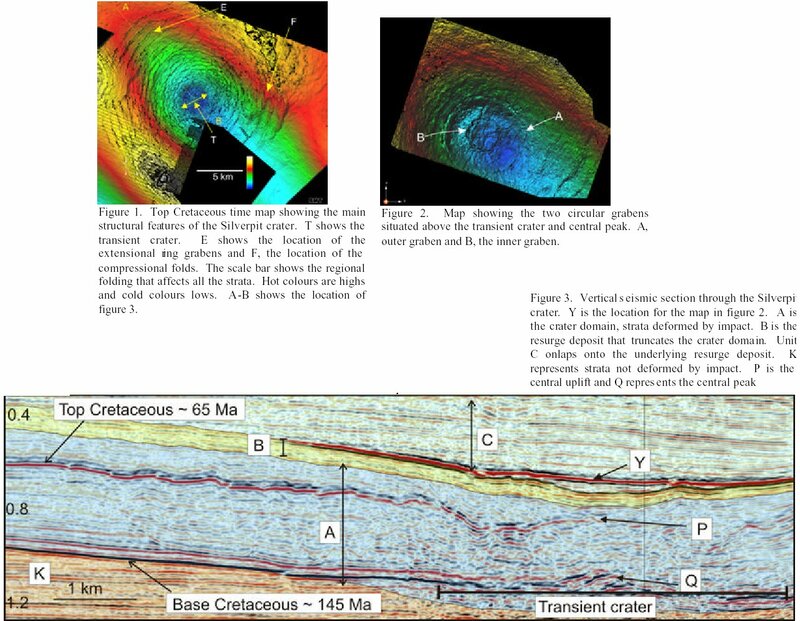 Vertical scale of seismic and annotated sections is exaggerated approximately x2. 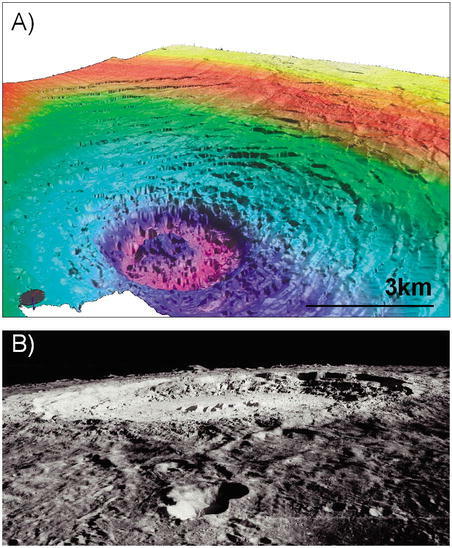 Zones 1,2 and 3 correspond to the central crater, and zones of concentric rings characterized by asymmetric tilted fault blocks and symmetrical graben. (Stewart Simon A., Allen Phillip J., 2002). нОПЗПЛПМШГЕЧПК УМПЦОЩК ХДБТОЩК ЛТБФЕТ уЙМЧЕТРЙФ ЧПЪТБУФПН 60-65 НМО. МЕФ РПЗТЕВЕО РПД ДОПН уЕЧЕТОПЗП НПТС Ч ~150 ЛН Л ЧПУФ. ПФ бОЗМЙЙ. фТЕИНЕТОБС УЕКУНПЪЕНЛБ нпч РПЛБЪБМБ ЮЕФЛП ЧЩТБЦЕООХА ГЕОФТБМШОХА ЗПТЛХ, ФЕТТБУУЙТПЧБООЩЕ УЛМПОЩ ЧБМПЧ. лТБФЕТ уЙМЧЕТРЙФ РПДПВЕО ЪЕНОПНХ ХДБТОПНХ ЛТБФЕТХ ДЙБНЕФТПН 5-8 ЛН, ОП ПФМЙЮБЕФУС НОПЦЕУФЧЕООПУФША ЛПОГЕОФТЙЮЕУЛЙИ ЛПМЕГ. уЙМЧЕТРЙФ ПФОЕУЕО Л ЖПТНБГЙЙ НОПЗПЛПМШГЕЧЩИ ВБУУЕКОПЧ ФЙРБ чБМШИБММЩ ОБ МШДЙУФЩИ УРХФОЙЛБИ РМБОЕФ-ЗЙЗБОФПЧ. лТБФЕТ уЙМШЧЕТРЙФ, РП-ЧЙДЙНПНХ, ХОЙЛБМШОЩК. чЩРПМОЕОП НПДЕМЙТПЧБОЙЕ ПВТХЫЕОЙС РЕТЕИПДОПЗП ЛТБФЕТБ ДЙБНЕФТПН 3 ЛН Й ЗМХВЙОПК 1 ЛН, ЧПЪОЙЛЫЕЗП Ч ЗПТЙЪПОФБМШОПК ФТЕИУМПКОПК НЙЫЕОЙ. дЧБ ТБЪМЙЮОЩИ БМЗПТЙФНБ НПДЕМЙТПЧБОЙС ЛТБФЕТППВТБЪПЧБОЙС РПЛБЪБМЙ НПЭОПУФШ ЧЕТИОЕЗП ИТХРЛПЗП УМПС НЕМПЧЩИ РПТПД ~1 ЛН. (Collins G.S., Turtle E.P., Melosh H.J., 2003). (Cartwright Joe, Huuse Mads, 2005). (Conway Z.K., Haszeldine S., Rider M., 2006).